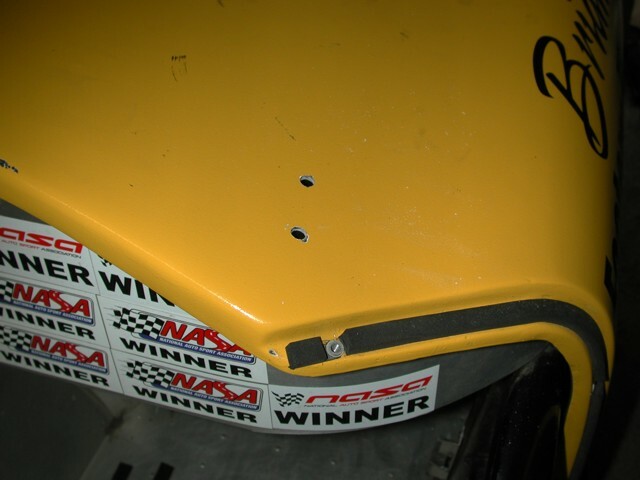 Below is my install to meet the new front body mounting requirements of rule 3.9. In no way is this the only way to do it but should give you a guide to the process. Once again I was lucky in that the front body of my car was already off. This made my install pretty easy and straight forward. Having completed it, I feel that it could be done with the body on but with considerably more difficulty in locating the holes. 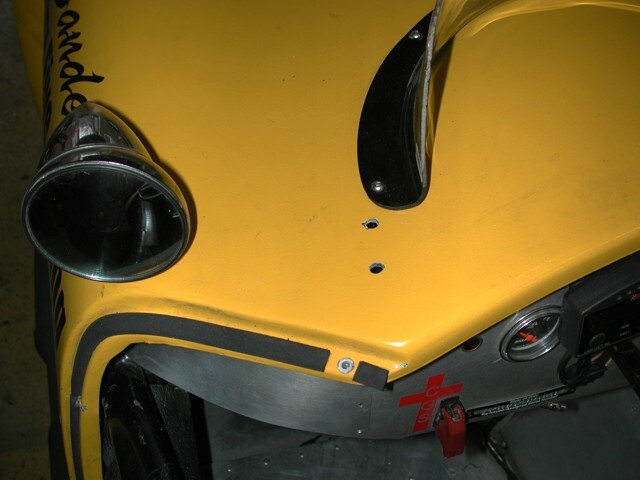 To help prevent intrusion of the body into the driver’s compartment, the cowl area of the body (the area above and forward of the dash) must be through bolted to the two ¾” steel tubes on the chassis that extend forward from the dash hoop into the engine bay. Two 5/16 inch diameter bolts must be used on each side. 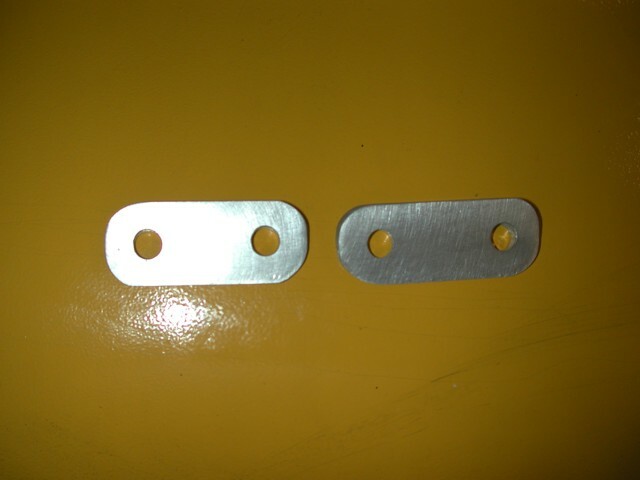 Large washers should be used on both the body and chassis sides to prevent bolt heads from being pulled through. Since these cars are hand made and owner built, the measurements I give below are only presented to describe the process. Your measurements will more than likely be different. I started on the driver side because of the wind screen. I knew I would have to work around it. NOTE: You may have to remove and relocate your wind screen. First you need to figure out where below the body is the ¾” tube. Use whatever method works for you. The goal at this point was to get a rough idea where the bolts through the body would hit the ¾” tube. What I found was that if I put the first hole close to the dash hoop, I could get the second hole about 1.5” to the front and still clear the windscreen with room for an oversized washer. 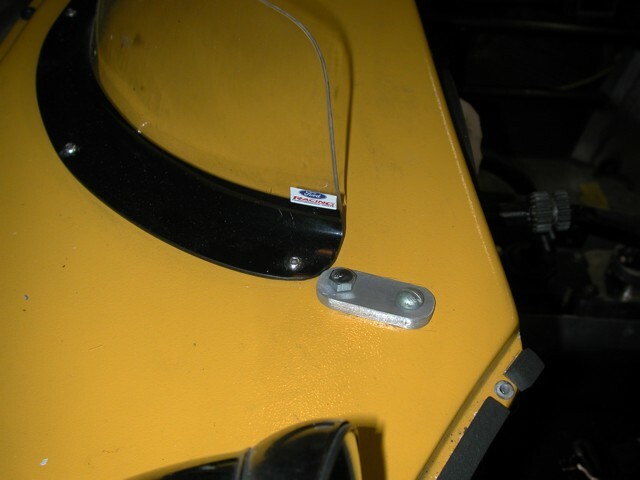 Bolts are inserted just to show hole location. Since there was nothing on the passenger side to work around, I simply dilled to holes in approximately the same position as the d-side. 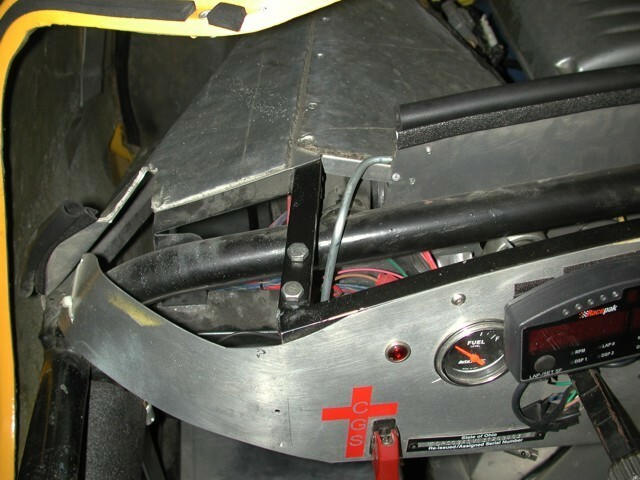 At this point, the body was put in place and aligned with the normal body mounts. Note: Put the bolts in as to assure the body is aligned as it will be when you bolt everything at the end. With the body in place, stick your drill bit up through the holes in the ¾” tube from the bottom and twist it. This will mark your hole on the body. Next the body was removed and the holes were drilled. With the holes drilled, put the body back on and check the holes you just drilled. I did this with a 4” 5/16 bolt. What I found is the holes in the body were drilled at a slightly different angle. To bring everything in alignment, run your drill bit down through the body holes and into the frame holes. This will align the holes. By now you may have noticed that you have drilled through a part of the body that is not horizontal and that the bolt heads will not sit flush to the body. Also, there is a considerable gap between the underside of the body and the ¾” tubes. In order for this mounting to be strong and do what is intended, you will need to fabricate some spacers and decide what you are going to use on the top of the body. In my install, I determined the d-side mounts sat on a 12.5 degree slope and the p-side was 18 degree. I measured the gap between the body and tubes. Note: They were different on both sides, 1.125” on d-side and 0.875” p-side. I cut the above angles into some 9/16” nylon rod that I cut to length and drilled. Nylon spacers to go between body and 3/4" tube. Angle cut to match body. As for washers on top of the body, I looked for a solution but could not find any beveled washers that would work in this situation. So it was down into the metal shop to fabricate a solution. Below is my solution. The aluminum pieces are approximately 1”x2.5”. I milled the body angle into them and they fit perfect. Cut to angle of the body. Put it all together and you have a very strong mount with the load on the bolts distributed properly. You might get away with using flat washers but my fear was that the body might tear due to an uneven load under normal conditions. The bolts you see in the above pictures are just there for demonstration purposes. 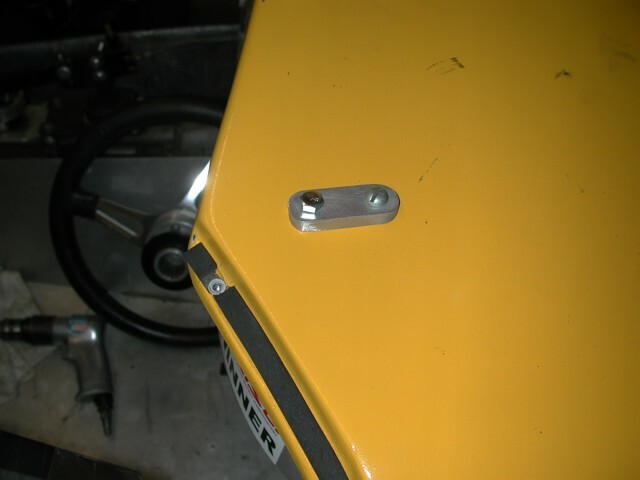 I plan to use stainless steel button head cap screws, like the FFR provided body bolts, in the final installation. For my installation, I ordered 3” bolts for both sides and Nyloc nuts. I won’t say this was an easy modification but it is certainly necessary. Watching a video of my head on collision last year, I saw just how far the cowl lip of the body intruded into the cockpit. I was lucky it was on the p-side. Had it been the drivers side, I’m sure it would have hurt my hands.